‘Blogging’ in general is a term that has been around for a good few years now now and it has basically been a platform for individuals and companies to state their opinion, views, knowledge or anything else for that matter in the hope that they can share their thoughts with others who, in turn, are often given the opportunity to respond – be it positively or negatively. Blogs still exist in their thousands in the written word from but with the explosion of interest in the likes of You Tube, many more bloggers are turning their attention to expressing their thoughts in visual form. There are many reasons why people might want to create a video log or ‘vlog’ as it’s often abbreviated to. Some expert bloggers who have been doing it a long time hope to gain enough subscribers so that, in the end, they can actually make money via paid advertising just for airing their views. Others might use it to promote a business whilst many people produce video blogs simply because they have a passion for a particular interest. People who specialise in a niche subject are far more likely to be successful than those who generally just want to rant on about anything and everything. For example, if you’re an expert in coarse fishing, you’ll probably find that those who visit your video blog will also have an interest in it too and will be glad of a site that will provide them with useful information and a chance to air their views too. What Are The Benefits Of Video Blogging? Well, firstly, let’s dispel the myth that you’re in it to make money. The fact that some people’s video blogs have enabled them to work at it full or part-time and to derive an income from it are far in the minority to those who produce them don’t go into it because you think there’s easy money to be had. The main benefits are that you can express your thoughts on a subject and share others’ opinions and get feedback from all over the world and it gives you the opportunity to meet others who share common interests or passions – even share negative views. Basically, it’s a bit like having your own community. If you’re a bit of an expert on a specific topic, it also allows you to gain recognition and to enhance your reputation and, in certain instances, this might lead you to being offered new employment opportunities. Once you’ve entered into the world of video blogging, you’ll also no doubt get interested in discovering other people’s video blogs which will increase your own knowledge, perhaps challenge you into questioning your own assumptions and lead you into exploring other interests. What Do I Need To Be Able To Blog? 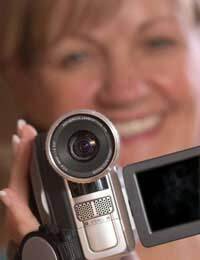 Basically, all you need to create a video blog is a camcorder, some video editing software and an appropriate hosting site to which you can upload your finished blog. Some of these hosting sites are free to post to, others will charge. Basically, it can be as free as you want it to be but, if you want your very own domain as opposed to sharing a hosting platform with others, you’d usually have to pay for that privilege. How Can I Attract Viewers To My Video Blog? Getting into the habit of creating a new blog at regular intervals is one good way of keeping people coming back to your site. If you post on a set time each day or on a set day each week or on a monthly basis on a specific date, people will be more inclined to keep coming back for more. If you go into it half-heartedly and your blog remains static because you haven’t posted anything new for a while, people will get bored and will soon move on to another blogger’s site. Posting comments in other people’s blogs and submitting your blog to other well known social media sites are other good ways to get your blog noticed and don’t forget to tell your friends and family, of course as word of mouth advertising has never gone out of fashion.